Solvents are supplied to bona fide laboratories in the UK only. A minimum order value of £75.00 + VAT applies, and carriage is charged at cost. 'HPLC Grade' is not an industry standard, and so there is considerable variation throughout the industry. At the bottom end are those who simply 'batch select' their solvent, and anything which allows UV light to pass through is called HPLC grade and may not even meet AR spec! Some manufacturers distill their solvents and test for chemical as well as optical purity. 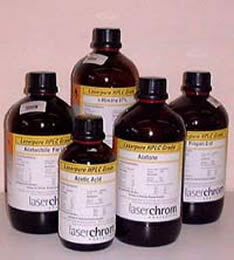 Laserchrom HPLC grade starts out as AR grade raw material, following which it is distilled at least once and filtered. The importance of solvent purity is that when analysing 20ul of sample, looking for possible sub picogramme levels of sample, impurities in the 20-30ml of solvent used during a run can be quite significant. Ghost peaks may arise during gradient elution, and if these co-elute with a peak of interest, they may pass un-noticed until a blank is run. Some hydrocarbon solvents (such as heptane) are very expensive in pure form and 95 –97% may have to be used. However, impurities are very similar alkanes and normally have little effect on the separation.